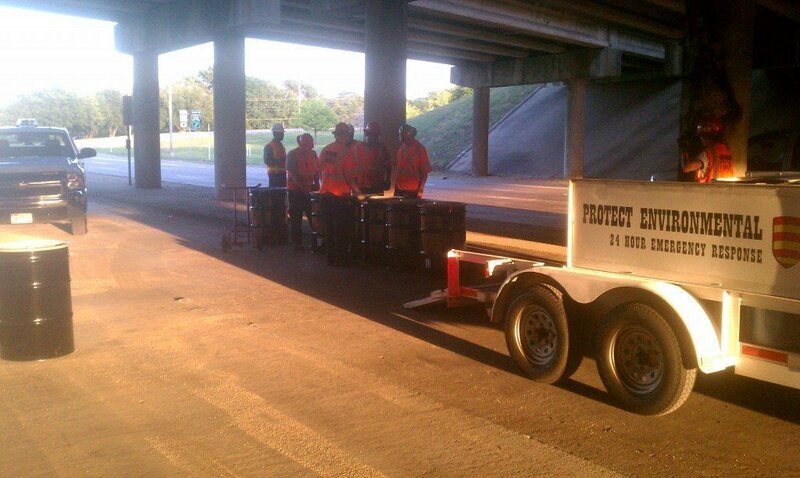 A Protect team responding to a diesel spill in Dallas. 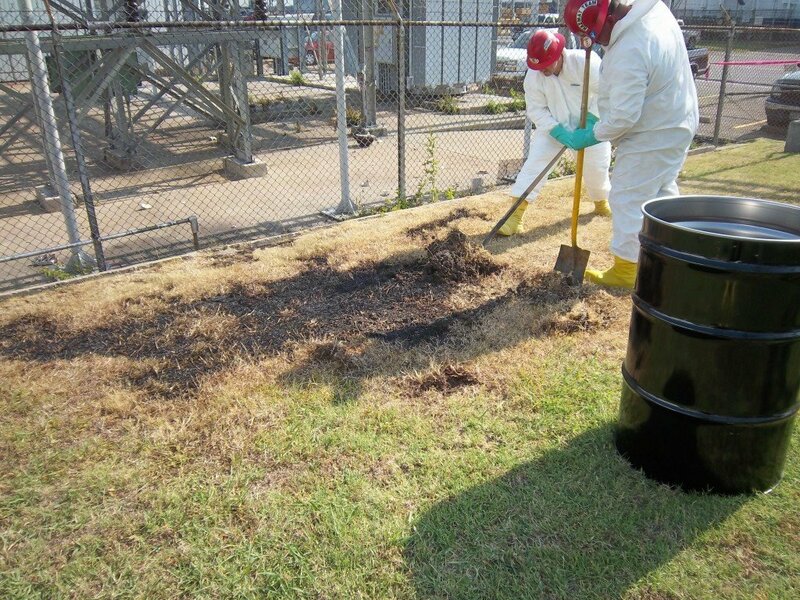 At Protect Environmental, we know that when a spill of regulated material occurs, it is important to take the proper reporting actions immediately to ensure compliance with state and federal laws. The person or company that is deemed the responsible party is not only liable for cleanup costs but can also have hefty fines levied against them by the state if the spill is not reported within a certain time frame. Any company can suddenly face the challenges posed by a chemical or fuel spill and Protect Environmental has not only completed cleanup operations on thousands of incidents but has also documented every step for client reports. The Environmental Protection Agency (EPA) and the Texas Commission on Environmental Quality (TCEQ) have established reportable quantities for nonhazardous and hazardous materials when they are spilled onto land or water. This means that a call to the TCEQ and/or the National Response Center (NRC) must be made when a spill of a material over its reportable quantity occurs. The reportable quantity for petroleum products spilled onto land is twenty-five gallons and onto water is any amount that creates a visible sheen. Statistics from the Department of Transportation’s Pipeline and Hazardous Materials Safety Administration (PHMSA) show that roughly half of all reported hazardous materials incidents involve a release of flammable/combustible liquids such as gasoline or diesel. It is a good idea to always report a spill involving a diesel powered truck or piece of heavy equipment since it is difficult to determine exactly how much of the material was released. Information about the incident needs to be recorded immediately once it occurs so it can be relayed to the proper authorities. The spill location, cause, date and time it occurred, material spilled and estimated quantity, extent of injuries or fatalities and the responsible party’s contact information are just a few of the things that should be communicated when making the initial call to report the spill. After state and federal agencies have been notified, a detailed log of all cleanup activities at the site should be maintained which is something Protect does for its clients. In Texas, a written follow-up report on response actions must be submitted to the TCEQ within 30 days of the discovery of a spill of a material over the reportable quantity. This report should chronicle events and include equipment and personnel deployed, containment actions taken, specifics about the area that was contaminated, weather conditions, maps, photographs, analysis results, amount of waste generated and disposal documents. The information in the report not only verifies that the response was sufficient to clean up the spill; it is also compiled into statistics that guide public officials when making policy decisions and aides companies in identifying best practices for improving worker safety. Protect Environmental is the emergency response contractor for the TCEQ in North Texas and has worked with them for years. Our staff is equipped and trained to not only provide efficient and cost effective cleanup services, but to also document the operation and draft the reports for our clients that the law demands. You should not wait until you have an emergency to call Protect Environmental. Contact our office to set up a no-cost emergency response contract so that if the worst does happen, you’ll know that Protect Environmental’s HazMat teams can take action without delay and that all reporting will be taken care of. Protect team excavating PCB contaminated soil near a damaged power transformer. There are many chemicals that can cause health and environmental problems if mishandled or accidentally released and Polychlorinated Biphenyls (PCBs) are a family of chemicals that require special consideration. PCBs have several qualities that made them ideal for use in a multitude of products but over the years, the toxicity and other dangers of PCBs have become more apparent. Production of most products that contained PCBs were banned in the United States after 1978. However, PCBs can still be found in numerous places and can still pose a health risk to the public. PCBs were commonly used in the production of transformers and capacitors as a coolant, insulation oil and hydraulic fluid due to its’ high flashpoint and chemical stability. They were also used as additives in pesticides, cutting oils, flame retardants, paints, caulking and adhesives. PCBs are classified as persistent organic pollutants because of their ability to accumulate in organic tissue and their resistance to environmental degradation. Humans exposed to PCBs may develop skin abnormalities, fatigue, coughs and liver damage along with certain forms of cancer. Many plants that manufactured PCB products leaked the PCBs into the soil and water around them; leading to massive environmental remediation efforts. Also, caulk containing PCBs used in the construction of buildings may have contaminated adjoining materials. If a building was constructed before 1979 and the lighting ballasts do not have labels that say “No PCBs”, the occupants of the structure may be at risk of PCB exposure. Removal and disposal of waste materials such as liquids, soil, building materials and electrical equipment that contain PCBs is regulated by the Toxic Substance Control Act (TSCA) which are found at 40 CFR Part 761. There are many rules that categorize PCB wastes but in general the TSCA should be considered when PCB concentrations in the waste material are at or above fifty parts per million (50 PPM). State and local governments as well as landfill operators decide where PCB wastes with concentrations below 50 PPM are accepted. Any chemical spill or waste that is suspected of containing PCBs should be handled by competent contractors that have the equipment and knowledge needed to limit negative environmental and health impacts. Protect Environmental is always ready to assist clients with accidental PCB discharges or remediation of areas contaminated with PCBs.